DOUBLE YOUR TERROR WITH TWO-HEADED TRANSPLANT FILMS! A lot of my time at Wormwood Laboratories is spent tinkering with so-called "normal" biology...maybe that's why I've been kicked out of every university I've attended! 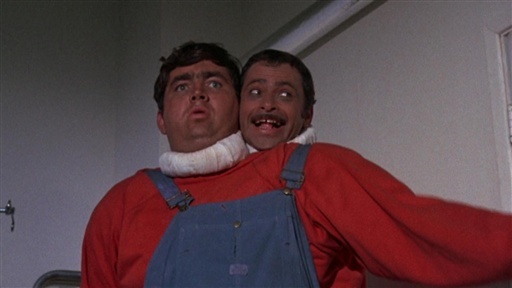 I've always been inspired by the concept of two heads on one body and with my latest PHILM PHREAKS article, I explore classic movies dedicated to the idea that two heads are better than one! I take an in-depth look at THE MANSTER, THE INCREDIBLE TWO HEADED TRANSPLANT and THE THING WITH TWO HEADS and see what makes them both alike and different. Dr. Suzuki, Dr. Girard, Dr. Kirshner....I salute you! Read the results of my investigations RIGHT HERE! On a more serious note, tragedy has struck the Wormcrew again. The father of our writer GREG "COLONEL ANGUS" OLMA has passed away suddenly. And the fathers of THOR and PROF. JOCKO are also struggling with health problems. Take some time out to send good wishes towards these gentlemen and their families, if you will. SYBREED "God Is An Automaton"
DOWN "Down IV, Part I: The Purple EP"
ALUK TODOLO "Occult Rock 1 & 2"